Review Summary: It's become a ritual. Week after week I make it a point to gauge audience expectations from a forthcoming movie on Twitter and Facebook. When an awe-inspiring actor makes a debut as a director, there are obviously high expectations. After surviving almost three hours of this well-meaning but unbearably indulgent film, the audience is likely to be perplexed. Perfect one-day cricket conditions, as the English would say. It's become a ritual. Week after week I make it a point to gauge audience expectations from a forthcoming movie on Twitter and Facebook. There is an absolutely devastating moment of pure drama in this eagerly-awaited, far-from-disappointing romance. Mausam, the debutant venture of Pankaj Kapoor is a pleasant journey through the dark and unpleasant historical events as a backdrop. He's a peacock and she's a swan and the twain shall never mate. The film is slow and disappointing! ‘Mausam’ is essentially a Shahid Kapoor film! As per the makers, 'Mausam' tries to bring in an old world charm into the proceedings. Just to jog audience's memory though, even Raj Kanwar directed 'Sadiyaan' [Ever heard of that? It was Luv Sinha's debut vehicle] had attempted that some time back and the results were miserable. Well, 'Mausam' isn't any better and that by itself is a terrible piece of news. 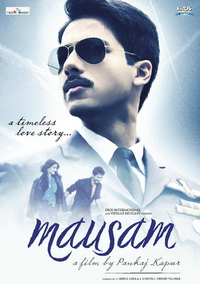 Mausam does not have the heart-warming quality of a love story to please the hearts of the audience. It will not be able to do substantial business at the box-office although reaching the average mark may not be difficult. owever, the issues have been sorted out and the film is now set for release. Mausam is flawed and tiresome but still has a good chance with people who are simply in love with love.